In older versions of SQL Server, the "sa", System Administrator account is given a blank password by default. In SQL Server 2014, that is no longer the case. 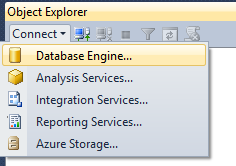 Connect to SQL Server instance using by clicking on "Connect" then select "Database Engine"